Assembling the set for a major arena concert, moving heavy equipment for a construction project, loading cargo on a ship, Riggers set up or repair rigging equipment so that loads are moved safely and accurately. Riggers select the appropriate gear, such as cables, pulleys, and winches, to move particular load weights and sizes. After assembling the rigging, they test it, attach loads to the rigging, and move the loads using cranes or hoists. 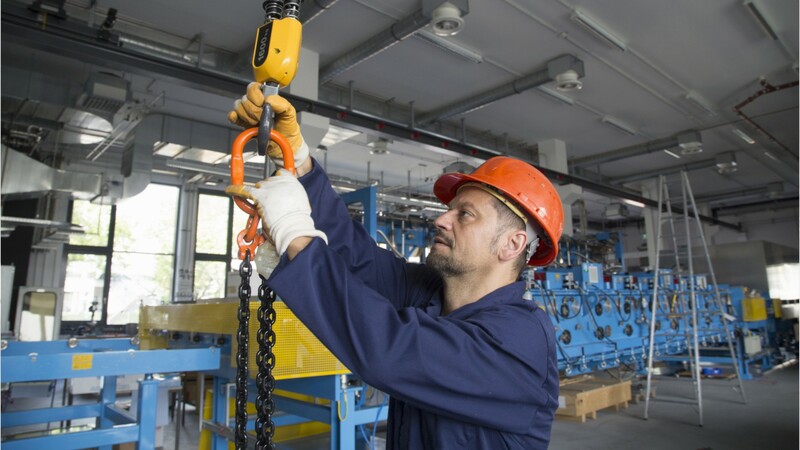 Riggers use verbal and hand signals to communicate with other workers to hoist and move materials. Riggers must maintain control of load movement and navigate confined spaces and narrow openings. They also set up and repair structures such as scaffolds, and dismantle them after use. As they work both in and out of doors, around heavy equipment and materials, riggers regularly wear safety shoes, hard hats, hearing protection, and other safety gear. Being successful as a rigger requires good communication skills, fast decision making, precision, and physical coordination. In addition to construction, shipping, and the entertainment industry, riggers work in logging yards, and in manufacturing plants. Most rigger positions require a high school diploma and on-the-job training. Riggers by U.S. Department of Labor, Employment and Training Administration is licensed under a Creative Commons Attribution 4.0 International License.